It is on the basis of this expertise and know-how that FHM presents a prime investment opportunity in the form of Certificate of Investment (Musharakah based) and promises best possible returns to investors with complete security. Certificate of Investment (Musharakah based) is available in various tenures (3 months to 5 Years) with flexible profit payment plans to meet your requirements. We offer best possible return on Certificate of Investment (Musharakah based) for different tenures, Our competent and experienced fund managers are fully aware of investor's concern for their investment i.e. to get best returns with maximum security and that's why we provide unmatched protection with flexibility and profitability. 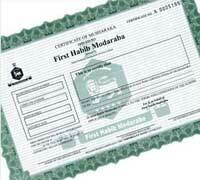 Certificate of Investment (Musharakah based) can be purchased by individuals as well as corporate and other concerns. “The Certificate of Investment (Musharakah based) of the Modaraba are subject to various risks including credit risk and liquidity risk. The prospective investors/customers are advised to conduct their own due diligence prior to investing in Certificate of Investment of the Modaraba”.